Maya and the Book of Everything Is Ready! Today is a very big day at the little house in the big woods. My YA fantasy novel, Maya and the Book of Everything, is ready to be ordered as a Kindle ebook from Amazon and as a quality paperback from the publisher, Hinterlands Press. In a few days, the paperback will also be available through Amazon, and this will include Amazon in Canada as well as in other countries. I will let readers know when it is available through Amazon, but I do want to mention that I will receive larger royalties if the book is ordered directly from Hinterlands Press. However, in the end, it’s all good, no matter where Maya is ordered, and we hope you enjoy the book. For anyone who would like a signed copy, use the contact form, and I’ll get back to you. For new readers of this blog, here is Clif’s nifty little description of my novel:Maya and the Book of Everything is a contemporary fantasy/science fiction novel set in various locations, including Waterville, Maine. The main character, Maya, is a fifteen-year-old girl who is drawn into an adventure involving a shadowy organization, the enigmatic Book of Everything, and the League of Librarians. Maya travels back in time, to distant planets, and to the mysterious Great Library, home of the Book of Everything. Anyway, what a wonderful way to start the Monday after Thanksgiving. Truly, I am so grateful for all the help I’ve received and to have this book published. 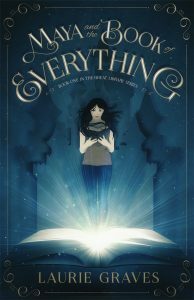 Previous Post Previous Post: Fourteen Days Until Maya and the Book of Everything Is Published!